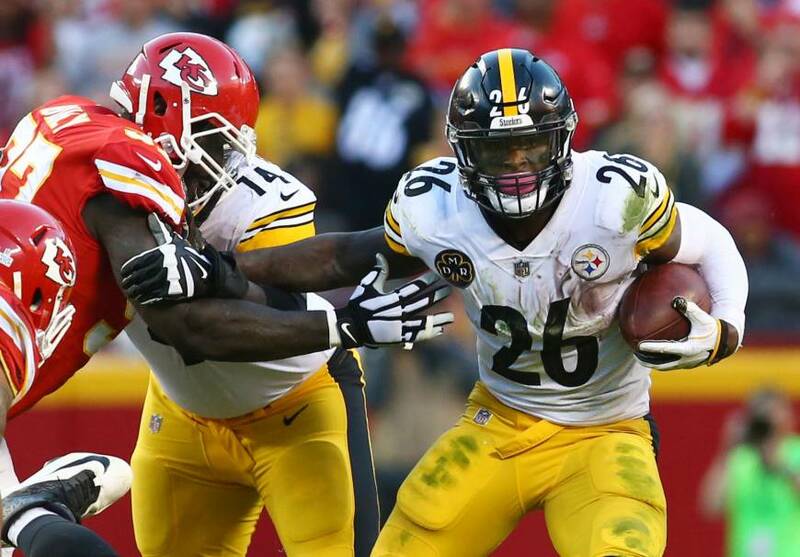 KANSAS CITY, MISSOURI - Le’Veon Bell and the Pittsburgh Steelers spent Sunday beating up on the Kansas City Chiefs. 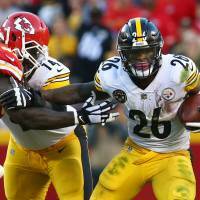 The Steelers’ star running back churned out 179 yards and a touchdown in a performance reminiscent of January’s playoff victory over Kansas City. And Antonio Brown made an acrobatic touchdown catch in the fourth quarter to help Pittsburgh hand the Chiefs a 19-13 loss — their first of the season. Their defense forced a quick three-and-out, and Tyreek Hill’s 32-yard punt return gave them the ball with 1:48 to go. But after the Steelers (4-2) gave up a first down, James Harrison sacked Alex Smith on third-and-10, and the quarterback’s incomplete pass on fourth down left the NFL with no unbeaten teams. “We straightened a few things out the second half. That’s how we got back in the game,” said Chiefs coach Andy Reid, who will no doubt be questioned for going for it on fourth-and-2 at the Steelers 4 early in the fourth quarter, rather than kicking a field goal to get within 12-6. Smith’s throw to the end zone fell incomplete and the Steelers took possession. His favorite target was Brown, who a few weeks ago was flipping over water coolers but spent Sunday slinging high-fives. He had eight catches for 155 yards, often beating star cornerback Marcus Peters. In Minneapolis, Harrison Smith led Minnesota’s defense in a thorough dismantling of Green Bay, as the Vikings knocked Packers quarterback Aaron Rodgers out of the game with a broken collarbone during a victory that drastically altered the course of the NFC North. In Denver, Eli Manning ignored the loss of four wide receivers, and reeling New York capped a stormy week of injuries and infighting by stunning the Broncos. In East Rutherford, New Jersey, Tom Brady set the NFL record for regular-season victories by a quarterback, getting his 187th. In Houston, Deshaun Watson threw for 225 yards and three touchdowns, becoming the first rookie in NFL history with at least three TD passes in three straight games. In Oakland, Nick Novak kicked a 32-yard field goal on the final play and the Chargers took advantage of a key missed extra point by Giorgio Tavecchio. In Glendale, Arizona, Adrian Peterson rushed for two touchdowns and 134 yards in an impressive Cardinals debut. In Baltimore, Connor Barth kicked a 40-yard field goal with 2:08 left in overtime, and the Bears used a 167-yard rushing effort by Jordan Howard to beat the Ravens. In Atlanta, Jay Cutler threw a pair of touchdown passes, Cody Parkey kicked a pair of field goals and the Dolphins rallied from a 17-0 halftime deficit. In Jacksonville, Pharoh Cooper returned the opening kickoff 103 yards, one of two special teams touchdowns that helped the Rams. In New Orleans, running backs Mark Ingram and Alvin Kamara combined for 237 yards from scrimmage, and the Saints’ resurgent defense forced five turnovers and scored a franchise-record three times. In Landover, Maryland, Washington’s Kirk Cousins threw for two touchdowns, ran for a score, and also had an interception as part of an inconsistent performance.